I have such fond childhood memories of spending summers on Cape Cod. Even after 30-some years, I haven't tired of going there summer after summer. And now that I'm a mom, I'm eager to share the experience with my son and introduce him to all that the Upper Cape (Bourne, Falmouth, Mashpee, Sandwich, and Barnstable) has to offer. 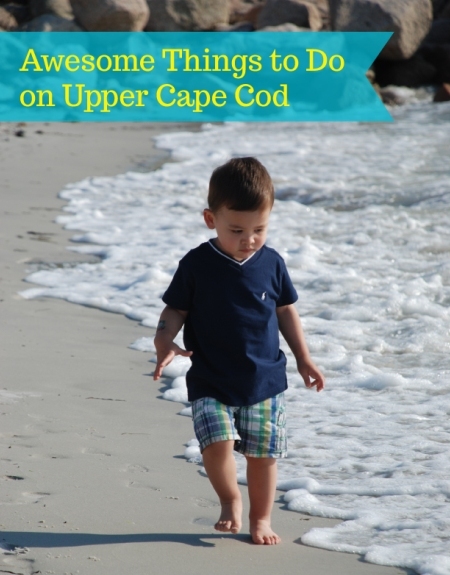 I particularly love the Upper Cape because it's closer to Boston -- handy when traveling with kids who may not tolerate long car rides, and wonderful for day trips if overnight lodging is out of budget. Here are some suggestions for family-friendly activities in the area. 1. Be a beach bum. A must, obviously! Old Silver Beach (Falmouth) is one of the best Cape beaches for kids because of its soft sand, gentle waves, abundance of sand bars, and warm, clear, shallow waters at low tide. Caveat: You must get there early. Parking fills up quickly on weekends. South Cape Beach (Mashpee) -- also open to the public and with a large parking lot -- is another great option for kids. Insider Cape Cod offers the low-down on some other Upper Cape beaches. 2. Fly a kite. Pick up a kite and head over to the kite field at the intersection of Falmouth Heights Road and Grand Avenue in Falmouth. It's a beautiful sight to see all those vibrant colors soaring through the sky. 3. Visit Woods Hole. Fun and educational for the whole family, the Woods Hole Science Aquarium is a small public aquarium that displays 140 species of marine animals. Admission is free, but donations are appreciated. Try to schedule your visit around seal feeding time (most days at 11 am and 4pm) to give the wee ones a little extra excitement. 4. Go clamming. Check the tide charts and go clamming and exploring at low tide. This is a wonderful opportunity for children to view and gently handle many creatures of the sea, including my son's favorite: horseshoe crabs. Treading is a clamming technique that is easy for anyone to pick up and requires no equipment. NB: You will need a shellfishing permit to take any clams home. And be sure to have little ones wear water shoes as they'll likely encounter many sharp, broken shells. 5. Visit a lighthouse. Visit a historic lighthouse and enjoy scenic views at Nobska Light. Lighthouse tours are conducted by the US Coast Guard. Admission is free and open to the public. The tower is open only during scheduled open houses. 6. Enjoy some farm fun. Pick strawberries and visit farm animals at Coonamesset Farm, a membership, pick-your-own farm in East Falmouth. 7. Cool off at the children's museum. Cape Cod Children's Museum in Mashpee offers many hands-on, interactive exhibits for little ones. 8. Enjoy a seaside stroll, roll, or bike. Bike. blade, or take baby for a leisurely stroll along the Cape Cod Canal or the Shining Sea Bikeway. 9. Classic family fun. CartWheels 2 is a family fun center in Bourne featuring go carts, bumper boats, miniature golf, whiffle ball cages, and an arcade. 10. Head to the fair. The Barnstable County Fair runs July 20-27. 11. Splurge on seafood. Enjoy a delicious, budget-friendly lobster roll at Cooke's Seafood or splurge on the massive lobster roll (which IMHO is enough to feed two hungry adults) at Bob's Seafood Café. 12. Try something new. Feeling adventurous? Try the lobster ice cream (you read that right) at Bill and Ben's Chocolate Emporium (featured on the Food Network Channel!). 13. Just play. My little guy can't go more than a day or so without asking for a playground so it's always useful to know where to find playgrounds on the Cape. 14. Make a train stop. Although not technically on the Upper Cape, Edaville Railroad is a fun pit stop on the way down to the Cape for the little train-enthusiasts in your life. We love that this amusement park has rides and attractions that even the littlest toddlers can enjoy, including Flying Turtles and the Cranberry Bog Ballpit. Finally, I hate to bring up winter in the middle of the summer, but now's the perfect time to start thinking about your holiday cards. We've had great luck capturing family portraits at Falmouth Heights Beach in the evening. What better background is there than the Atlantic? Have other favorite Upper Cape gems? Feel free to share in the comments below!